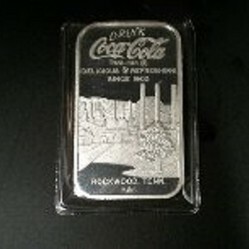 The Coca-Cola Company has issued a number of highly collectible silver bars and others in different metals. The images on these bars are incredible. They are highly collectible. Beginning in 1975, and lasting into 1988, the Coca-Cola Company celebrated its seventy-fifth anniversary of operating bottling plants. The Coca-Cola Company had earlier origins, and operated making drinks served at fountains, but the bottling plants were reaching their seventy-fifth anniversaries. This was celebrated with the release of some special collectible items. Among these items were decorative bars, and a few rounds. A round was issued in 1986, during the seventy-fifth celebration, celebrating the one hundredth anniversary of the Coca-Cola Company, then another round celebrated the one hundred twenty-fifth anniversary appeared. The introduction image is our own image. Of the bars and rounds, some are made with fine silver. The bottling plants often used their own image, sometimes an image of a delivery wagon, sometimes an image of a bottling plant, sometimes an image representing the area in which the bottling plant was located, and sometimes just a Coca-Cola themed image. There is a generic design that many earlier issues used or slightly modified. Most contain the name of the city in which the issuing bottling plant was located. A few, such as Florida, North Carolina, and Louisiana represent an entire state. Now every issue was a bar, or ingot. Louisville, Honolulu, and Louisiana issued rounds. And, in some cases other material other than fine silver were used. The entire list, including some materials that are unique to only one bottling plant, include bronze, brass, silver filled, bronze filled, gold plated, aluminum, plastic, and gold. Louisiana, in addition to the silver round issued three aluminum rounds using the same image, one anodized in purple, one in green, and one in gold, the Mardi Gras colors. Honolulu issues a gold plated bronze round, and a red plastic token. Louisville issued gold rounds, as well as others, and issued both bars and rounds. There are just a few gold pieces issued, and they are not likely to become available. Some bottling plants changed their design in some minor way during the process. This resulted in there being multiple types. In several cases bars have surfaced with one blank side. These are probably test bars, used to check the look of the design before minting began. One sided bars are rare, and usually bring in high prices. These are not in the catalog. If both silver and another metal bars were minted for the same bottling plant, the design was not changed. Just as with coins, the value depends on the mintage, and the condition. Some bars, but certainly only from a limited number of bottling plants, were destroyed. This too affects availability. Expect to pay a reasonable amount over the value of one Troy ounce of fine silver, the amount of silver in a silver bar, up to hundreds of dollars for a rare bar. Bronze and brass bars are also in limited supply, so they are not inexpensive. If you buy these online do check the value of the bar you are buying. Some sellers do not realize, and that is giving the benefit of a large doubt, that some bars should not be as expensive as others. The rounds are not quite the same as the bars. The specifications on the Louisiana round is nine tenths of a Troy ounce of fine silver. Yet, people advertise these as one Troy ounce on Ebay. Thomas Mott has issued a fine handbook on these ingots and rounds. This book contains the list, mintages as can best be determined from not well kept records, and images of the entire collection. The issuing mint, most often the world Wide Mint, is also specified. He has cataloged these, in association with the foremost authority on silver bars, Archie Kidd. I highly recommend the book, but only at a reasonable price. It often appears on Ebay for a price in the sixties, a fair price. I occasionally see copies advertised on Amazon for hundreds of dollars. These ingots were issued in soft plastic holders. Some come with the Certificate of Authentication and a plastic stand. The serial number, along with the weight and purity of the metal if the bar is silver, is located on the edge. Many people have not heard of these. Information is scarce. In fact, when I needed to research bars for my online store before I bought the book I would do a search. Unfortunately, most of what came up I had also written. 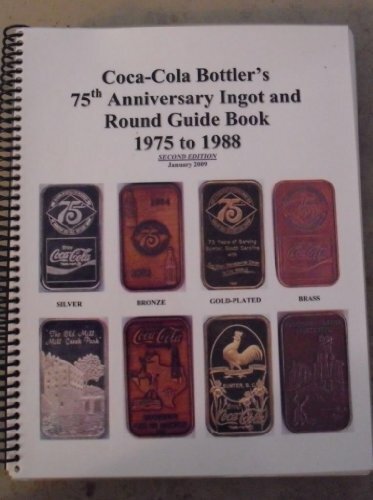 I looked in a general Coca-Cola collectibles book and could not find these listed. The method of distribution varied from bottling plant to bottling plant. In some cases they were sold, others were given to employees, and still others were issued as prizes to contests winners. There was no uniform method of distributing these prized items. Today, they are bought from their owners.